Mouse anti Human CD209 antibody, clone MR-1 (MCA2318) used to evaluate DC-SIGN expression on cultured THP-1 cells by flow cytometry. Role of DC-SIGN in the anti-DENV2 activity of bLF. 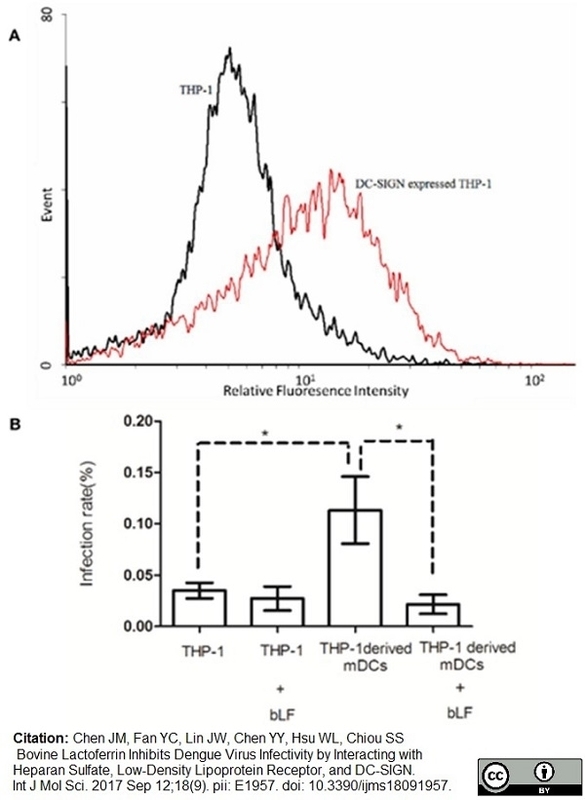 The THP-1 cells were stimulated with recombinant IL-4, GM-CSF, and TNF-α according to a previous report , and dendritic cell-specific intercellular adhesion molecule 3-grabbing non-integrin (DC-SIGN) expression was subsequently measured by flow cytometry using mouse anti-human DC-SIGN antibodies and fluorescein isothiocyanate (FITC)-conjugated goat anti-mouse immunoglobulin G (IgG) antibodies (A) The DC-SIGN-expressing and non-expessing THP-1 cells were treated with 200 μg/mL bLF, then infected with DENV-2 at MOI of 5, and analyzed by infectious center assay; (B) The infection rate equals 100 × (plaque number/cell number) (* p<0.05). From: Chen JM, Fan YC, Lin JW, Chen YY, Hsu WL, Chiou SS. Bovine Lactoferrin Inhibits Dengue Virus Infectivity by Interacting with Heparan Sulfate, Low-Density Lipoprotein Receptor, and DC-SIGN. Int J Mol Sci. 2017 Sep 12;18(9). pii: E1957. Mouse anti Human CD209 antibody, clone MR-1 recognizes human DC-specific ICAM-3 grabbing nonintegrin (DC-SIGN), a ~45 kDa C-type lectin that binds ICAM-3 also known as CD209. CD209 is primarily expressed on a population of immature dendritic cells in peripheral tissues and on immature myeloid monocyte-derived DC's in vitro. CD209 is involved in dendritic cell (DC) migration and the initial interaction between DC's and naive T lymphocytes. CD209 also binds HIV-1 gp120 and plays a key role in the dissemination of HIV-1 by DC's. Mouse anti Human CD209 antibody, clone MR-1 is reported to partially block the functional activity of DC-SIGN (Melero et al.). Immature myeloid monocyte-derived dendritic cells (MDDCs). Spleen cells from immunized Balb/c mice were fuzed with cells of the Mouse SP2/0-Ag14 myeloma cell line. Relloso, M. et al. (2002) DC-SIGN (CD209) expression is IL-4 dependent and is negatively regulated by IFN, TGF-beta, and anti-inflammatory agents. J Immunol. 168 (6): 2634-43. Melero, I. et al. (2002) An anti-ICAM-2 (CD102) monoclonal antibody induces immune-mediated regressions of transplanted ICAM-2-negative colon carcinomas. Cancer Res. 62 (11): 3167-74. Domínguez-Soto, A. et al. (2011) Dendritic Cell-Specific ICAM-3-Grabbing Nonintegrin Expression on M2-Polarized and Tumor-Associated Macrophages Is Macrophage-CSF Dependent and Enhanced by Tumor-Derived IL-6 and IL-10. Chang, S.K. et al. (2008) B lymphocyte stimulator regulates adaptive immune responses by directly promoting dendritic cell maturation. Alvarez, C.P. et al (2002) C-type lectins DC-SIGN and L-SIGN mediate cellular entry by Ebola virus in cis and in trans. J Biol Chem. 283: 31511-21. Relloso, M. et al. (2002) Dendritic cell (DC)-specific intercellular adhesion molecule 3 (ICAM-3)-grabbing nonintegrin (DC-SIGN, CD209), a C-type surface lectin in human DCs, is a receptor for Leishmania amastigotes. Ciudad, M.T. et al. (2016) Analysis of the HLA-DR peptidome from human dendritic cells reveals high affinity repertoires and nonconventional pathways of peptide generation. Chen, J.M. et al. (2017) Bovine Lactoferrin Inhibits Dengue Virus Infectivity by Interacting with Heparan Sulfate, Low-Density Lipoprotein Receptor, and DC-SIGN. Int J Mol Sci. 18 (9)Sep 12 [Epub ahead of print].